Climate change. Two words which hold, between them, some of the most complex as well as vigorously debated issues of all times. Changing Climates, a four-part series produced by the Television Trust for the Environment (tve) in association with the World Wide Fund for Nature and the United Nations Environment Programme, tries to unravel some of these complexities and understand issues systematically. In the process, it neatly demystifies the convoluted subject of global warming and climate change for the public. What strikes one as the series progresses is the ease with which the films glide from one issue to the other, without in any way compromising on the relevant details, or the sense of urgency that the subject is meant to evoke. Most of this is achieved by the clear structure of the series: divided into The Science, The Politics, The Impact and The Future, it tells the story of climate change in a chronological sequence. As they roll across the screen, years and their events make it easy for the viewer to keep a tab on the milestones crossed (or tripped over, as the case may be). From 1827, when the theory of global warming surfaced for the first time, to the 2000 The Hague Climate Conference and beyond -- the films cover a lot of ground and take the viewer with them. Changing Climates: The Science, the first film in the series, traces the history of the science of climate change. While rising levels of carbon dioxide (co2) had been a cause for concern ever since the Keeling curve (named after its conceptualiser Charles Keeling) demonstrated the enormous jumps in co2 in 1958, it was in the 1980s that the panic buttons began to be pressed in earnest. And in 1988, the us Senate received the first hard evidence from American scientists that the world was getting warmer. The next film in the series, Changing Climates: The Politics, delves into a complex and difficult subject -- referred to as a "snakes-and-ladders story" in the film -- with characteristic verve. 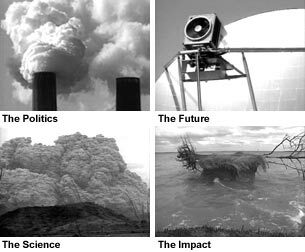 Having established the scientific basis for the theories of climate change, the series now looks at how governments are responding to the threat, and what impact the mega-climate conferences (the ninth one is currently on in Milan, Italy) have had in controlling greenhouse gas emissions. The North-South issues of contention are brought forth clearly -- the South's attempt to get a fair deal is enumerated emphatically in the film by cse founder director, the late Anil Agarwal. The film ends on a note of warning for the us (the biggest polluter, with only 4 per cent of the world's population and 25 per cent of its pollution): following the stalemate at The Hague, nations are increasingly realising that a protocol without the us is better than no protocol. Changing Climates: The Impact is a well-told, hard-hitting documentation of the devastation that can be traced to global warming. From the rapidly depleting salmon fisheries in the North Pacific to the pest-ravaged spruce forests in Alaska; from the vanishing glaciers of Montana to storms and floods induced by sea-level rise across the world -- case studies of environmental upheavals brought about by climate change are convincing. The film also examines the health effects: an alarming rise in cases of smog-induced asthma (especially among the younger generation) and more frequent outbreaks of diseases like 'highland malaria'. The series rounds off on a positive note, though without diluting the immensity of the crisis. Its examination of new, cleaner technologies in the fourth film, Changing Climates: The Future, offers a wide range of options to keep global warming at bay: from solar, wind and wave-powered technologies to alternative fuel-driven vehicles. More importantly, the final film attempts to establish the viewer's faith in humankind's ability to confront -- and conquer -- problems of gargantuan scale, despite sputtering global negotiations on climate change. Ken Pugh's narration is uniformly good throughout the series, and it is just one of the elements that make the series an eminently watchable one.